The Western is probably the most formal and stylised of all cinema genres. As a result, there are only a handful of films which succeed in providing something genuinely new within the traditional formula. Among these, Shalako stands out as one of the most fascinating; a multi-million dollar production that takes an unusual view of the American West, looking at it through the eyes of the Old World as it clashes violently with the emerging culture of the New. Adapted from a novel by best-selling Western author Louis L'Amour, Shalako follows the adventures of a party of European aristocrats on a hunting tour of New Mexico in the 1880's. Led into violating an Apache reservation by their cowboy guide, they are attacked by Indians and one of their number, French countess Irina Lazaar, separated from the main party, is saved only by the intervention of the former U.S. cavalry officer Shalako, now turned cowboy. While Sean Connery's Shalako. the Indians and the hostile environment all represent the American West as it is, the party of ultra-civilised aristocrats defiantly stand for the values of the Old World. The resulting conflicts, both physical and cultural give the film an extra dimension that lifts it far out of the run of more commonplace Westerns. Lifting Shalako even further into the category of major entertainment is the casting of the leading roles. 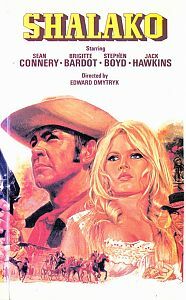 Sean Connery makes Shalako considerably more than just a routine Western hero and the playing of Brigitte Bardot as the countess Irina opposite him gives the film that final added dimension - genuine female star quality. In a strong cast, Honor Blackman as the English Lady Daggett and Peter Van Eyck as the bullheaded General von Hallstatt stands out. Hollywood director Edward Dmytryk, veteran of such Westerns as Broken Lance, Raintree County and Warlock, drives the film along with pace and action, making excellent use of the Spanish locations which stand in for New Mexico. Distribution: EMI Videogram (THORN EMI VIDEO-logo on the tape).